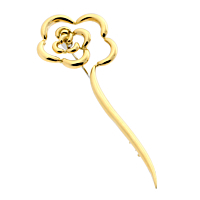 Chanel's Camellia Brooch combines the natural flowing beauty of flowers with a lighthearted and modern twist. 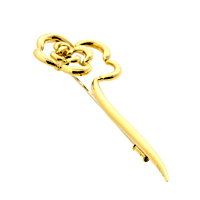 Chanel has designed this piece to also be worn as a necklace and or pendant, making it appropriate for day or evening accessorizing. The Camellia is solidly crafted from bright 18K yellow gold that is highly polished to impart a gleaming and dew-like finish.